TPWD worked with local partners to enhance fish habitat in this reservoir. Crappie condos and Mossback Safe Haven structures were installed in 2016. Habitat efforts were funded by the Brazos River Authority. Construction and placement were accomplished with the help of the BRA, the Baylor TriBeta Biology Honors Society, other volunteers, and TPWD. 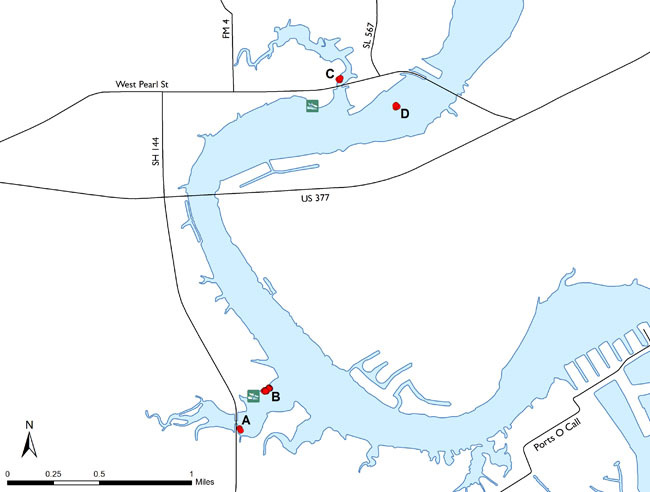 Locations of fish-attracting structures are shown on the map and charts below. Coordinates are in degrees, decimal minutes. They are also available in downloadable files. Texas Highway 144 bridge near Rough Creek Par, on the left along the riprap as you approach the bridge from the lake. Water depth 8 to 14 feet, eight crappie condos and four Safe Havens. 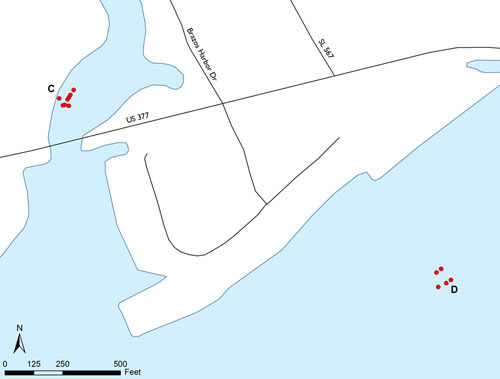 Habitat placed below pier, a few to the left, and most placed to the right of the pier. 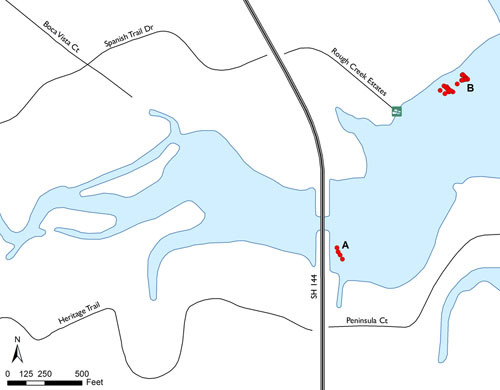 Water depth 7 to 15 feet; 20 crappie condos and 12 Safe Havens. Habitat surrounds fishing pier from immediately below the pier to about 25 feet out. Water depth 10 to 16 feet, 20 crappie condos and 12 Safe Havens. Habitat placed within and immediately adjacent to a giant dead tree on the left of the channel heading up the lake toward the East Pearl Street/Bus 377 bridge. Water depth 12 to 14 feet, 22 crappie condos.